Rock Carpet tm is an amazing new surfacing product ideal for flat surfaces. Its porous structure draws dirt & water away from the surface providing an always clean, safe, slip-free surface. Available in 21 natural colors. Blends and custom colors can provide thousands of design possibilities. 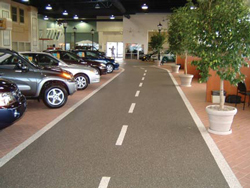 Rock Carpet tm is made from a combination of high quality, clear, UV resistant epoxy polymer and river rock. Rock Carpet tm stain resistant finish cleans easily with most household products, and keeps it’s beautiful shine with no waxing or buffing.